Nissan car sales topped 138,000 in the UK in 2014 – the best ever sales volume in the company’s history. 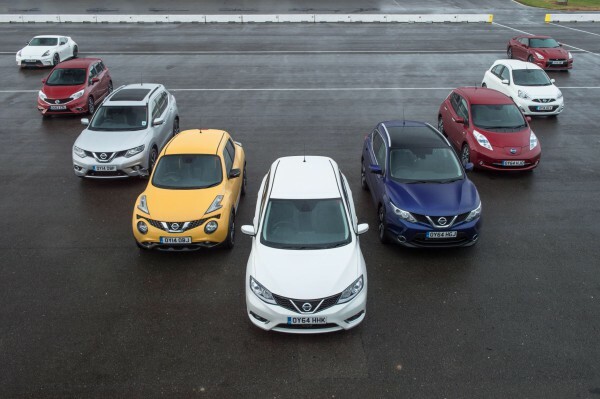 Share of the car market reached 5.6% per cent – cementing Nissan as the fastest growing top-10 brand in 2014. The all-new Qashqai secures the 6th spot in the sales charts. UK-built stars – Juke and LEAF – posted highest ever sales. Nissan’s Sunderland Plant output tops 500,000 for a third year running. Nissan Motor GB Limited recorded its best ever sales year in 2014 with 138,338 cars sold in the last 12 months. This represents a 17% increase over 2013’s figure of 117,967. Nissan also bolstered its position as the fastest growing top 10 brand in the UK, commanding a market share of 5.6% in 2014 – smashing yet another record. This increased share in the car market puts Nissan in sixth position in the UK. Boosting this sales success was Nissan’s UK-built stars – the new Juke and the 100% electric LEAF and the Note – all of which broke sales records for another year. The all-new Qashqai – which arrived in UK showrooms in January – continued its remarkable success story, attaining over 47,000 sales. The figures consolidated its position as the UK’s sixth best-selling car. The Juke also enjoyed a bumper year, with the updated version going on sale in June. During the last 12 months, Juke sales climbed from 37,488 in 2013 to 39,263. Proving its continued popularity with the British public, the latest figures confirm the Juke as the UK’s 10th best-selling car. Finally the all-electric LEAF clocked up 4,051 sales in the UK, more than doubling the volume sold in 2013 (1,812), confirming that the British-built Nissan LEAF remains the nation’s electric model of choice. The Nissan LEAF boasts 55% of the pure EV market and outsold its nearest competitor by more than 2:1. Nissan’s extraordinary sales success comes as Nissan’s Sunderland Plant broke the half a million production barrier again for the third year running, building a staggering 500,237 vehicles. James Wright, Managing Director, Nissan Motor GB, said: “Key to Nissan’s success in 2014 is the onslaught of new and updated products launched in the last year and I am immensely proud of the hard work and dedication displayed by the Nissan team in the UK. Nissan has launched no-less than nine new and updated products, starting with the multi-award winning British-built Qashqai in January. This was then followed by the MY14 GT-R, new Juke, all-new X-Trail, GT-R NISMO and the all-electric e-NV200. Nissan didn’t stop there and with Nissan’s return to the C-segment with the all-new Pulsar as well as the launch of the MY15 370Z NISMO and the Juke NISMO RS, the brand now has one of the youngest, freshest and most exciting product line-ups covering a diverse array of sectors. Including Light Commercial Vehicles (LCVs), Nissan sold 148,607 vehicles in the UK, up 16% from 128,586 in 2013. Previous Upgraded Jaguar XF models announced. Next Sam’s Sterling Bargain Buy.